Meeting other beekeepers in new places is one of the greatest joys of traveling, to me. 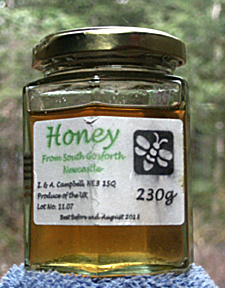 I recently went to Newcastle, in England, where I met beekeeper Ian Campbell. He’s a truly knowledgeable beekeeper whose honeybees live a world far different from mine. Ian keeps his hives in an allotment. These are areas in cities and towns that have been kept aside for growing vegetables. In the U.K. your house may not have enough room for a vegetable patch, but you can potentially get one near-by. Potentially, because where a few years ago there was not much of a demand, these days there’s a waiting list for allotment space. This increase in interest in gardening seems to have been mirrored in an increase in interest in beekeeping. Ian told me that when he started a few years ago, there were few beekeepers in the Newcastle Beekeepers Association, and the majority of them were older beekeepers. But the numbers have been growing and today the association has a good number of beekeepers of all ages. They are often called English or German or Irish Black Bee. It depends on what country you’re standing in. I had been told black bees were agressive : Ian’s bees were NOT aggressive, although he was quick to point out that if he has to work them with a storm coming, they can be annoying. All my bees can be very annoying if worked with a storm coming in. I’ve been told Apis mellifera mellifera were small. Ian’s bees looked good tome. He felt that he’d like to see an improvement in their size, but they were the same size as bees I’ve seen here in the Pacific Northwest. Ian generously went though an entire hive with me. The bees took it in their stride. Plus, in midMarch they were already showing good build-up. I was totally impressed. Things that are new here are old school there! Ian showed me the frames he uses and all I could think was “that’s the newest thing in US beekeeping!” : Thin frames. I had just learned about these from my friend Clyde (of our queen-rearing endeavors). Unlike the standard frames here in the US, Ian’s frames (of course I forgot the proper names), are thin – which allows for a better bee space. He said that some beekeepers use “Manly” (probably misspelled) frames, which are like ours here in the US. If the success of Ian’s bees are to go by, the thinner frames encourage both growth and increased stores in bees. I thought this was interesting. You can see what’s going on below without exposing the bees to the weather. Ian admitted that they take some on-going cleaning, as the bees propolize the plexiglass. Again, I wish I had a tape recorder (does any one remember those?) going, because there’s a lovely British name for these. Simple to make, wonderful to use: A light-colored cloth of medium density with a dowel sewn into each end. When completely unfurled, the cloth covers the entire top of the hive with about 2 inches hanging over each side. The dowels keep it in place. It keeps a box shaded if sunny; would keep a light rain off in a drizzle, and can be used to cover one portion of a hive while you work on another area. In the above image, you can see one cover in the background being used to cover a super. In the foreground, Ian is using the cover the frames he wasn’t working. I am making a few of these this year. But I’ll be making mine with light colored waterproof cloth for those “oh no!! !” surprise rain moments. The idea is so obvious, so simple, so useful, but it never dawned on me to make one, and I’ve never seen one in use here. No, not the wife and family, the honey. It is delicious. Ian asked my Ian and myself back to his place for a cup of tea, and gave us a jar of his honey to take home. It was an on-going temptation the entire time we were in the UK, but we wanted to keep it sealed until we passed US customs. The dents, the smears are all courtesy of the airlines. But the jar made it intact : no leakage. The lower level is because it’s so yummy – I had to remember to take the picture before we ate it all. Ian told us that he had placed it in a few shops and it had sold well. I am not surprised. It is light, but with a remarkable bouquet, slightly piquant. I will always be grateful to Ian Campbell for taking the time to share his hives and honey with us. Beekeepers are some of the best folks in the world. What beekeepers have you met on your travels? And what have you learned from them? That’s the news from Brookfield Farm Bees And Honey, Maple Falls, Washington – I’m back from my UK travels, feeding the bees, about to do splits, moving hives and, of course, watching the weather for breaks in the rain…. More to come. This entry was posted in Beekeeping and tagged Apis, beekeeper, Beekeeping, bees, Black bee, British, Campbell, England, honey, how to, Ian, millifera, Newcastle, U.K.. Bookmark the permalink.